Line art by Sean Izaakse. Colors by Marcio Menyz. Champions and all related content copyright © Marvel Comics. She’s young, has super powers and is indigenous! 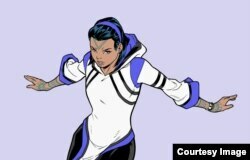 This week, a new superhero makes her debut in Marvel Comics’ Champion series: Amka Aliyak, alias Snowguard, an Inuit teenager who hails from the town of Pangnirtung, in Nunavut, one of the four regions that comprise the homeland for the Inuit population of Canada. She debuted in Champion’s April issue #19 as a normal Inuit girl whose curiosity is piqued by the sudden appearance of a mysterious factory near her community. When she decides to investigate, adventure ensues -- and, powered by an Inuit spirit-force named Sila, Amka gains the power to shapeshift, that is, transform into animal form. Detail from Marvel Comics Champions #19, introducing a new Inuit superhero, Amka Aliyak, a.k.a., Snowguard. Line art by Sean Izaakse. Colors by Marcio Menyz. Champions and all related content copyright © Marvel Comics. Fans of comic books will remember that the fictional superhero Spider-Man, created by Stan Lee and writer-artist Steve Ditko, began as a shy high schooler who was bitten by a radioactive spider, gaining superhuman agility. So, too, will Amka be struck with mythical power in Champions #20, which comes out this week, and her superhero persona Snowguard will be introduced in issue #21, to be released in June. Snowguard's powers are given to her by Sila, who is based on an old Inuit deity, Silla. Line art by Sean Izaakse. Colors by Marcio Menyz. Champions and all related content copyright © Marvel Comics. e character is the brainchild of Jim Zub, a Toronto-based writer, artist and art instructor who, this year, took over writing the Champion series, beginning with #19 in April. 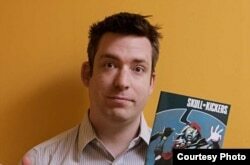 Comic book author Jim Zub. Zub said he has conducted extensive research into Inuit history and culture. 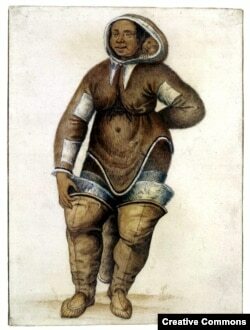 Details, he added, like traditional Inuit tattoos and clothing. 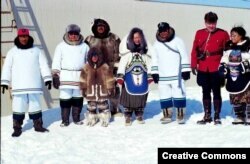 A group of Inuit in traditional dress pose during a ceremony on the occasion of the foundation of Nunavut, the homeland of the Inuit people of northern Canada, April 1, 1999. Traditional cultures have always admired the powers of certain animals, and the lines between the human and animal world blur in traditional Inuit stories in which shamans or Ijiraq, “shapeshifters,” transform into bear, wolves or caribou. “A lot of the stories are built around exemplifying good and bad behaviors, telling stories to demonstrate the ways we should treat each other and the things we should watch out for,” said Zub. But the character Amka is more than just her superpowers. She is also a typical modern Inuit teenager, struggling to find her place between traditional and modern cultures, questioning the stories and values of her grandparents. “These are things that people struggle with all the time,” said Zub. He acknowledges that he doesn’t want to overly focus on the negative experience of Inuit under Canadian rule or social issues facing the Inuit of Arctic Canada today. And, he does not want to ignore issues like poverty, food shortages and violence against women. "If we do it right, hopefully these kinds of bigger things come through in the storytelling," he said. Comic superheroes are often retired after a few issues; but, Zub says Amka is here to stay and will join a cast of seven other characters, among them Spider-Man, the Hulk and Ms. Marvel, to fight the bad guys and change the world.